Mignori is a mobile client to use with -booru or -booru based sites (Gelbooru and Danbooru, to name a few). A -booru imageboard is simply a board where people post pictures and tag with them relevant attributes. This allows other users to search for images in these boards and find images with the qualities they’re looking for. Mignori comes with Safebooru as a working server so you can start browsing images right away! You can also add any -booru based site to browse their servers. – Collections. The collections feature allows you to save images to the app and to categorize as you wish. You can create collections for Anime series, characters, favorite tags, the sky is the limit! To prevent Mignori for using a lot of space, Mignori will not store actual images in your device by default: By creating a collection, you are creating a “list of posts” you like. You can easily access your collections, and if the images aren’t cached, Mignori will simply download them again. This behavior can be changed in settings and you can force Mignori to permanently store images, in case your data plan is limited and you cannot redownload images every time you want to see them in your collections. Due note that if you use Mignori a lot this can cause the app to use a kit of your phone’s space. – Save images to camera roll. – Neat tags integration. You can view all the tags an image has, and then favorite them or search for images with those tags without having to type them manually. Favorite tags. If you find tags you want to store so that you can remember or access them later. – Blacklist tags. Mignori works as a web browser in terms of content, so it can’t control what images you see from external servers other than the one included by default. Blacklisting tags will prevent images with said tags to show up in your search results. – Filters. You can create “filters” to quickly manage your collections the moment you want to save an image. Filters allow you to specify a criteria for posts you want to add to your collections. Posts that match that criteria will then be managed by the action specified in the Filter. For example, you can create a filter to store all images that have the tags “brown_hair, green_eyes” to a collection called “Favorite Images”. You can also save to nested collections. Finally, you can create a filter that will save images to a specified album in your camera roll instead of in your collections. You can create up to two filters with the free version of Mignori. – Nested Collections: The free version of Mignori cannot nest collections. With this feature you can do even more relevant groupings. 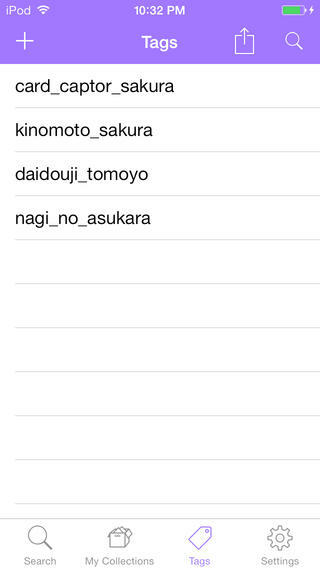 For example, you can create collections for your favorite anime series, and then sub collections for characters. – Search for more than two tags at a time. For the casual users, searching for two tags at most a time may be enough but if you’re a frequent user, you can buy Mignori pro and search for images that match as many tags as you want. – Export and import data. Exporting your data will create a backup of your servers, collections, tags, and filters. – Dropbox Sync. If you have more than one iOS device, you can keep all your instances of Mignori in sync via Dropbox. This also creates a backup of Mignori in the cloud so even if you don’t have more than one iOS device, you can recover your collections if you lose your only phone. (This app has been removed from the App Store. A rewritten version is coming soon). No source code available for this app.